Los Millares is an impressive size settlement that was in use from the end of the 4th millennium BC to the 2nd millennium BC. During these twenty centuries, the mysterious people who created this settlement became a highly advanced society famous for the production of copper and construction of a remarkable hillfort. The hillfort, which holds the secrets of the people who lived in those ancient times, was discovered in 1891. The people who unearthed it weren't researchers, but simply workers who were building the railway. The site lies about 17 km (10.56 miles) north from Almeria in Andalusia, Spain. The first person who led the works on this site was Luis Siret, whose excavations were like a mission of Indiana Jones. It was a search for the forgotten tribe, whose skills and life were more advanced than people had believed. 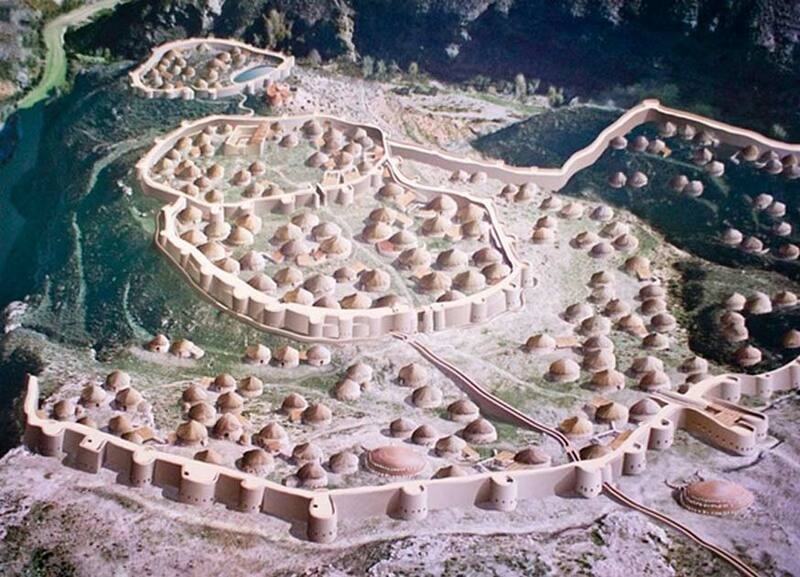 The complex was big enough to allow about 1000 people to live there and create an advanced ancient community. The remarkable hillfort covers the area of 2 ha (4.9 acres). According to the radiocarbon dating method, the hillfort collapsed in ancient times, but the inhabitants rebuilt it around 3025 BC. The hillfort is a masterpiece of its times. The road to the heart of the ancient village was surrounded by the careful eyes of guards located on four small stone fortifications located outside of the settlement. The outer ring runs more than 650 ft. (2132.6) It has nineteen circular areas that could be called bastions, and an entrance gate. Near the road protected by the four small forts, researchers unearthed the cemetery. This major discovery consisted of eighty passage tombs. The pottery of Los Millares was decorated with wares, including statues of idols and oculus motifs. The analysis of the grave goods from the necropolis of the society of Los Millares proved that the inhabitants of this settlement weren't of equal status. Moreover, it seems that it wasn't a very peaceful group. Archaeologists found evidence of wars among the neighbors. Who Were the Ancient People that Built the Remarkable Megalithic Tombs of Malaga? The culture of Los Millares had evolved from the previous local society, but they grew to dominate the entire Iberian Peninsula for several centuries. In around 1800 BC the original group of citizens of Los Millares was replaced by the people related to the El Argar civilization. They expanded by exploiting the achievements of Los Millares. This culture is also responsible for the growth of Vila Nova de Sao Pedro in Portugal. The inhabitants of Los Millares lived mostly from farming. However, they were also active on the trade route and had a unique skill – metal working focused on copper. The methods of making copper and other finds made inside the walls of Los Millares allowed the researchers to deduce the relationships between them and the other cultures from the Iberian Peninsula. The researchers found that they had to be connected with the civilization from Sardinia who created the famous step pyramid of Monte d'Accoddi. They obviously had contacts with similar settlements like Los Silillos and the area of Neolithic Cabrera. It has been proved that the Iberian settlements had a strong connection to each other and managed an effective trade route. Moreover, the society of Los Millares followed the remarkable trend of creating megalithic structures. The last inhabitants of Los Millares left this place about four thousand years ago. However, the site looks like it was abandoned much later. The numerous discoveries relating to the daily life of the inhabitants of Los Millares brought some rare information about their life. Apart from being such remarkable copper makers, they lived quite an advanced life, based on all of the available luxurious supplies known in the Iberian Peninsula. Fernando Molina, Juan Antonio Cámara, Los Millares, 2005.